This is a one day guided tour that takes you to the west of Varna. You will visit the mouth of Kamchia River and Kamchia Reserve, the rock phenomenon “The Wonderful Rocks”, the Ovech Fortress in Provadia, the Museum of Mosaics in the town of Devnya and the natural phenomenon - the Stone Forrest. You will be up picked from your accommodation/hotel in Varna at 9 am. In about 30 - 40 min drive southwards you’ll reach your first destination - the mouth of Kamchia River and Kamchia Reserve, which covers the lower valley of the Kamchia river. The area is remarkable for its unique flooded forests called "Longoz", wide beaches with sand dunes and old riverbeds. 245 species of higher plants, 39 fish species and 258 bird species have been established in the region. You will have an about 30 min boat trip to the fishing village and to the mouth of the river. In winter time instead of the boat trip, a lunch will be included in the price. Your trip continues to the rock phenomenon “The Wonderful Rocks”, a massif consisting of about ten beautiful rock needles, 40-50 meters high, shaped like castle towers. The rocks had formed directly by the banks of Tsonevo dam, where they are steepest and vertical. The phenomenon consists of three massifs. Three tunnels are dug through along their entire length, where an automobile road made of crushed stones passes. The next stop is the Ovech Fortress, a stone stronghold located on a rocky cliff overlooking the town of Provadia and its surroundings. Archaeological research established that the fortress was used in periods from the 3rd century to the first decades of the 7th century, and then from the 10th-11th centuries until the end of the 17th century. The fortress was inhabited successively by Thracians, Romans, Byzantines, Bulgarians, and Turks. Stop for lunch (at your own expense, except the winter time when instead of a boat trip a lunch will be included in the price) will be in a restaurant in Devnya serving traditional Bulgarian food. After the lunch break, continue to the the Museum of Mosaics, located in the town of Devnya. It is an in-situ museum that is housed in a specially constructed building whose purpose is to preserve the archaeological discoveries. A big Roman building with exquisite mosaics was discovered in this place. Five of the rooms and the portico are covered in multi-colored floor mosaics – some of the best examples of Roman mosaic art found on the territory of Bulgaria. Three of the mosaics are exhibited in the rooms where they were discovered. 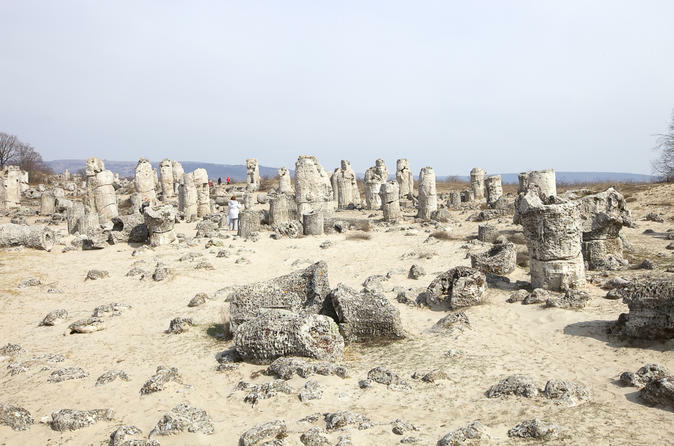 The last stop for today will be the Stone Forest, a fabulous natural pheno-mena most known with its Bulgarian name of "Pobitite Kamani", which means "stones beaten into the ground", a name completely corresponding to the reality. The spectacular landscape of "Pobitite Kamani" is spotty spread in a North - South orientated belt about 3 km wide and 8 km long. The stones are clustered in seven large groups and several separate small areas embracing a total area of more than 7 square kilometers. Тhe main, "Dikilitash" group is the most impressive and in a best state of preservation.